I have a ponytail palm that is forty years old. Two years ago it reached the ceiling. I cut off the top, hoping that it would send out suckers from the base, but it keeps trying to grow from the very top. I am hesitant to cut off the whole trunk for fear of killing it. Is there any way to encourage sucker growth lower down? 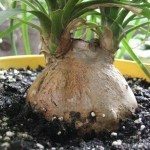 Since the ponytail palm is not a palm but is actually related to agaves, if you cut back that long trunk to whatever spot you want, there's a good chance it will start new growth, probably several heads, from near the cut end. You can also attempt to root the cut section. I would hold off on the cutting back until spring, when you can take the headless trunk outside (not to much sun if it's always been indoors) and water well, a little fertilizer, and the plant might well send out new leaves. It's not a sure thing, but a number of people have reported success doing this.